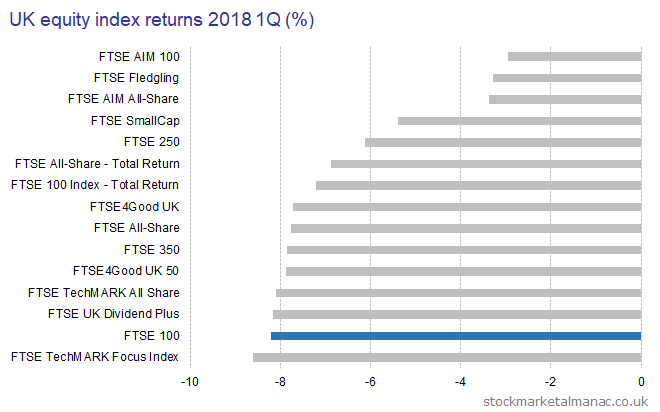 The following chart plots the performance of UK equity indices in the first quarter 2018. The data for the chart is given in the following table. 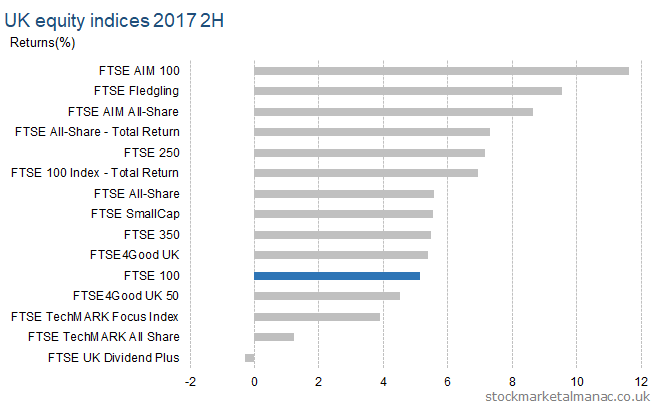 The following charts plot the performance of UK equity indices in 2017 for the whole year, second half and fourth quarter. 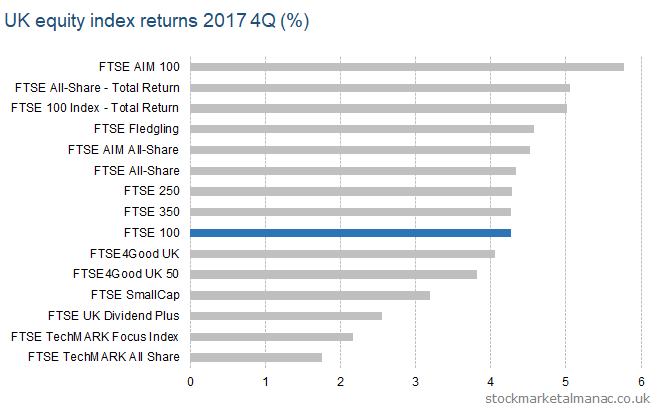 The following chart plots the performance of UK equity indices in the third quarter 2017. 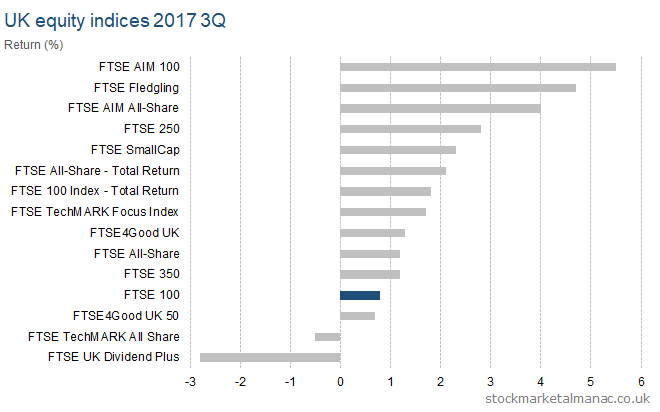 The following chart plots the performance of UK equity indices over the first 3 quarters of 2017. 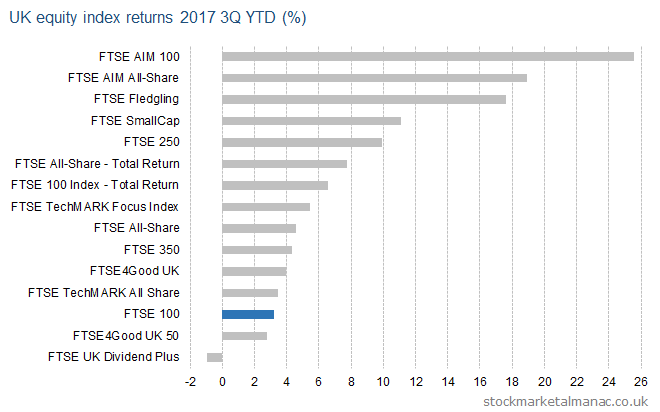 The following chart plots the performance of UK equity indices in the second quarter 2017. 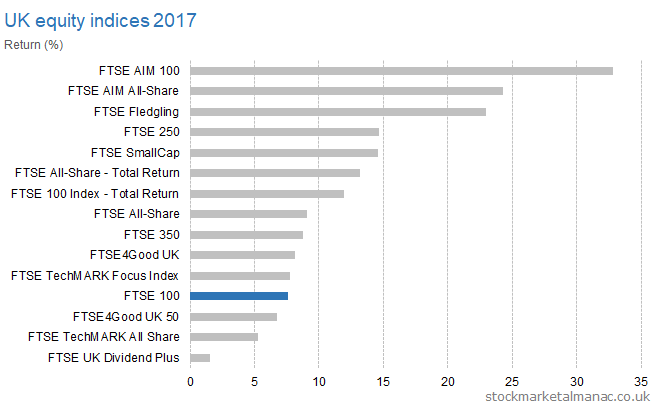 The following chart plots the performance of UK equity indices in the first half 2017. An update on the Sell in May Effect (also called the Six-Month Effect, or Halloween Effect in the US). 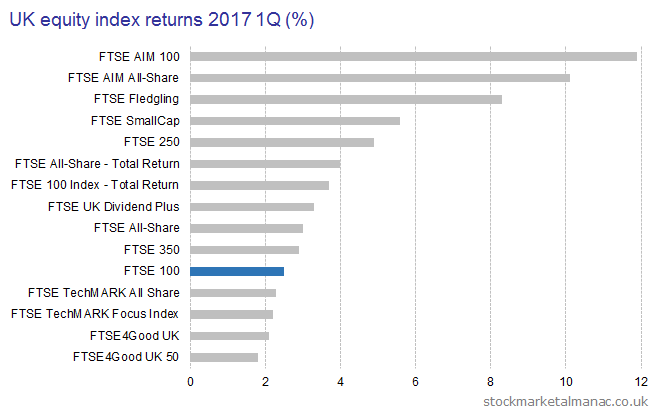 In the six months Nov 2016 to Apr 2017 (Winter period) the FTSE All-Share Index rose 5.2%. Previously, the Index had risen 10.1% over May 2016 to Oct 2016 (Summer period). The out-performance of the Winter market over the Summer market was therefore -4.9 percentage points, which does not support the Sell in May Effect. 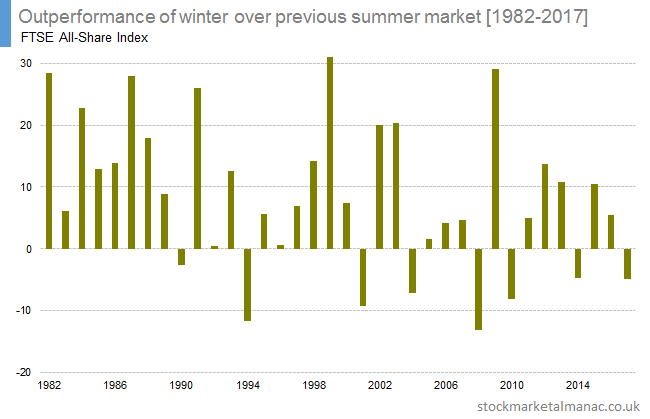 The following chart shows the out-performance of the FTSE All-Share Index in the Winter period over the previous Summer period since 1982. In the 17 years since 2000 the Winter market has outperformed the previous Summer market 11 times, with an average out-performance of 4.6 percentage points. As can be seen in the above chart, while in the longer-term the Sell in May effect is strong, in recent years it has become less reliable. It’s sell in May time again! And time for many articles appearing on whether to actually sell in May or not. So, should one sell? However, just because the market under-performs May-October doesn’t necessarily mean that the market experiences negative returns over these summer months. The following chart plots the 6-month May to October returns for the FTSE All-Share Index since 1982. 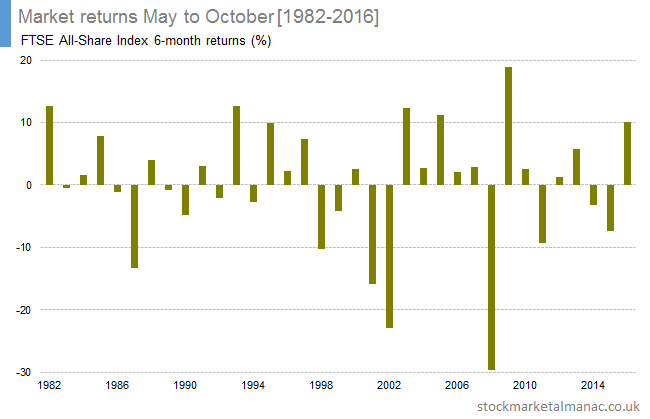 As can be seen, since 1982 the market has actually risen more often than it has fallen over the May to October period – equities have had positive returns in 20 of the past 35 years. The market has risen in ten of the last 14 years. 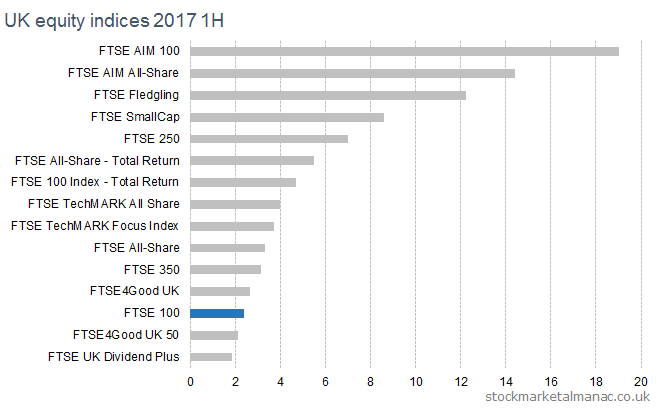 And last year, 2016, the FTSE All-Share increased 10.1% May to October. So, the case is not necessarily looking strong to sell in May. Especially, if one adds in the argument that being out of the market an investor will forego any dividend payments over the May-October period (and at a time when interest rates are very low). An argument in favour of selling might be that, although the market often sees positive returns in the period, when the market does fall, the falls tend to be quite large. So, since 2000, the average return May-Oct has been -1.1%. Admittedly, this is quite heavily influenced by the fall in 2008, which might be regarded as something of an anomaly. But over the longer periods, the average returns are negative as well (-0.1% from 1982, and -1.0% from 1972). In conclusion, whether to sell in May should likely depend on an individual’s attitude to risk and their transaction costs. Further articles on sell in May. 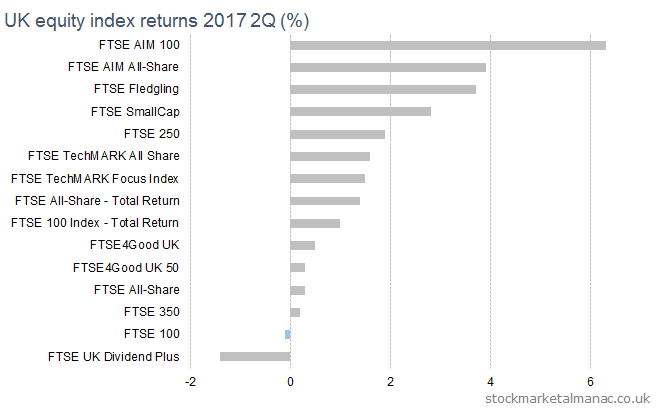 The following chart plots the performance of UK equity indices in the first quarter 2017. 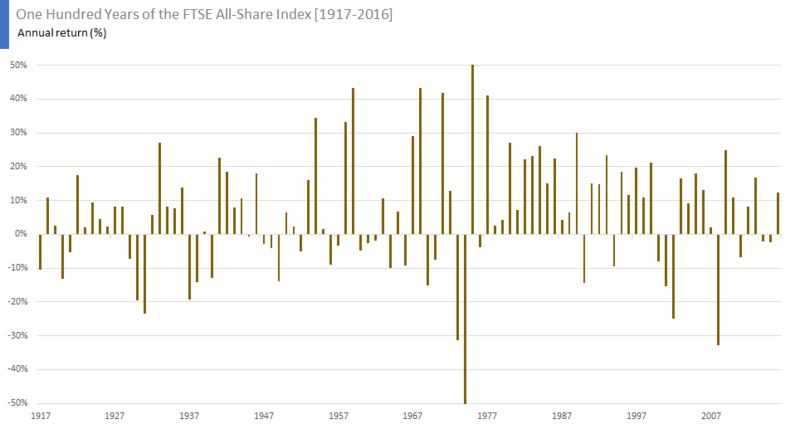 The following chart plots the annual returns of the FTSE All-Share Index for the 100 years from 1917 to 2016. The final bar in the chart plots the annual return for the index in 2016 (+12.3%). The Y-axis is truncated at +/-50% for legibility. In two years the returns were outside this bound: in 1974 the index fell 55%, and in 1975 the index rose 136%. Over the 100 years since 1917 the average annual return for the index has been +7.0%. The standard deviation has been 21.5, which means that for 66% of the years the return was between -14.5% and +28.5%. The index saw positive returns in 65 of the 100 years. The following chart is similar to the above, but ranks the returns in order of size. The return of 12.3% in 2016 ranks 35th in order of annual returns for the index in the last 100 years. What can the very long term tell us about the trend of the UK market? 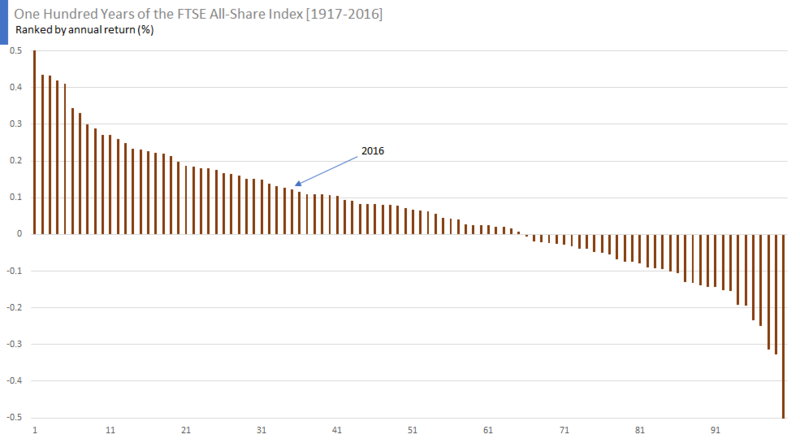 The chart below plots the FTSE All Share Index from 1946 to the present day. The Y-scale is logarithmic, which presents percentage (rather than absolute) changes better over long periods, and so is more suitable for long-term charts. The straight line is a line of best fit calculated by regression analysis. The R2 for the line of best fit is 0.96, which is impressively high for such a simple model (i.e. the line of best fit fairly accurately approximates the real data points). 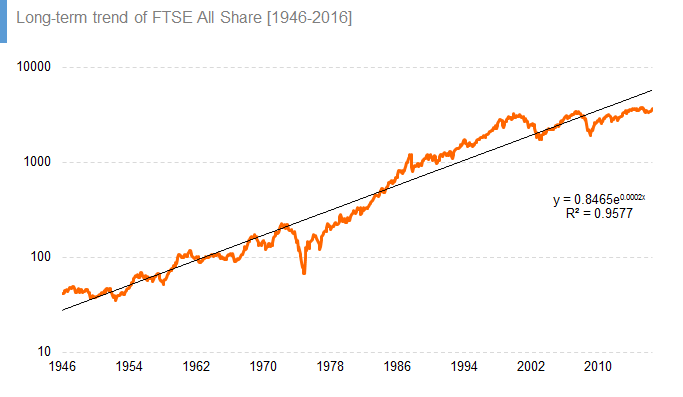 The FTSE All Share Index fluctuated closely around the trend line (line of best fit) from 1946 to 1973; it then traded consistently below the trend line until 1983, when it crossed over to trade above the trend line until 2001. From 2001 the Index was close to the trend, but then in 2008 fell significantly below it and has yet to revert to the long-term trend line. This equation allows us to make forecasts for the FTSE All Share Index. It is, in effect, the Holy Grail, the key to the stock market – as simple as that! For example, at the time of writing the FTSE All Share Index is 3664 while the above equation forecasts a value today (according to the long-term trend line) of 5878. This suggests the index is currently under-priced relative to the long-term trend line. But as can be seen in the above chart the index can spend long periods trading above or below the long-term trend line. 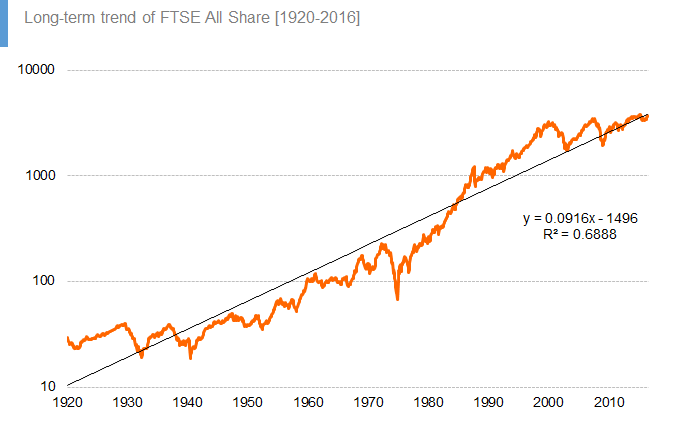 Now, if we think that the trend of the market in the last 70 years will broadly continue, then we can use the equation to forecast the level of the FTSE All Share Index in the future. And this is what has been done in the following table. Equivalent forecasts for the FTSE 100 Index have also been given. The equation says that the trend line value for FTSE 100 at the end 2017 will be 11,762 (75% above its level in November 2016,). By end 2020 the forecast is for a FTSE 100 level of 14,761 (+119%), and by end 2040 the equation forecasts a FTSE 100 trend value of 67,068 (+897%). We will now look at a trend line calculated from data 1920 to 2016. First, here is the chart from 1920 with its trend line. In this case, the R2 is 0.69, quite a bit lower than than the data from 1946 (i.e. the calculated trend line is not such such a good fit for the actual data). Again we can use the equation of the trend line to forecast trend values for future dates. Whereas for the data from 1946 forecast a FTSE 100 level of 11,762 at end of 2017, the 1920 data forecasts a level of 7,652 (14% above the current level). As can be seen above, the trend-line equation is very sensitive to the sample data (i.e. in this case, the choice of start date). So, which trend do you prefer, that from 1920 or from 1946? 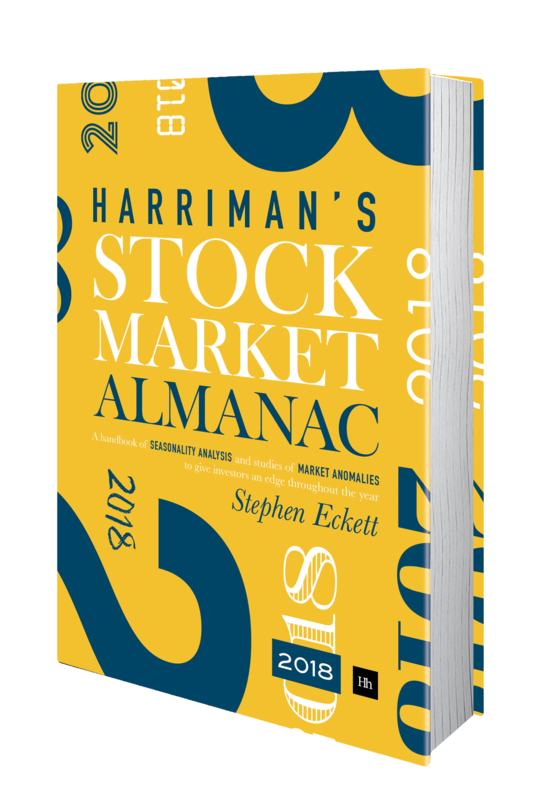 The above is partly an extract from the new 2017 edition of The Harriman Stock Market Almanac. 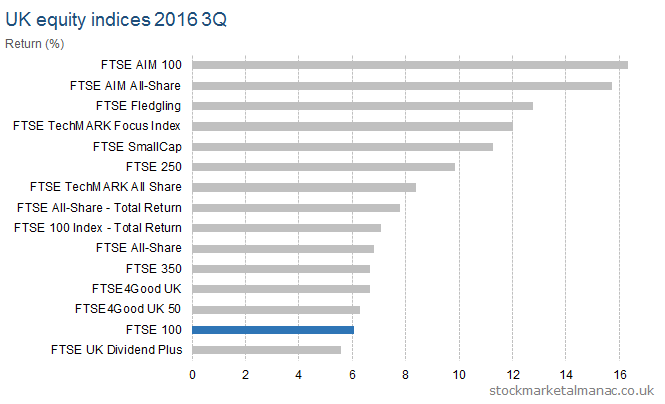 The following chart plots the performance of UK equity indices in the third quarter 2016. The following chart plots the performance of UK equity indices over the first 3 quarters of 2016.